I can’t tell you how many times over the course of my 20-plus year career as a published romance author I have been asked, “When are you going to write a real book? You know, a [insert genre of choice: mystery, historical, thriller, etc].” So I’d like to take this opportunity to tell readers why I write romance novels. I suffered a lot of tragedy while I was growing up, the worst of which was the death of my mother just as I was entering my teens. I felt as though I went from 13 to 35 overnight, and when my friends were off having fun, I was cooking and cleaning and helping my little brother with his homework. Romance novels were an escape for me. The Wolf and the Dove, The Far Pavilions, Whitney My Love, Rebecca, The Thorne Birds…if the book featured one man and one woman falling in love, I read it! Romance novels offered me hope for a happy future filled with love (hokey, maybe, but I was a naïve teen). As a young wife and mother, I discovered Silhouette Romance Novels. These books were short and sweet and uplifting. Each and every story put a smile on my face, and the happily-ever-after endings always boosted my spirits. Are romance novels real? No. Does every real-life relationship end in HEA? Of course not. But if I wanted doom and gloom, I’d watch the evening news. USA TODAY Bestselling Author Donna Fasano has written of over 30 novels that have sold nearly 4 million copies worldwide. You can find her on the internet: at her blog, and on Facebook, and on Twitter. She loves to hear from her readers. Her books are available at Amazon, Barnes & Noble, Smashwords, Kobo, Sony, and Apple iBooks. Exciting news! 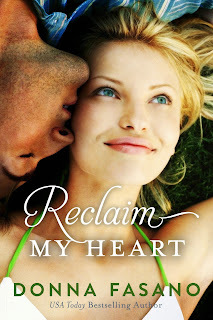 Donna's newest release, Reclaim My Heart, has been picked up by Montlake. Look for it in the US Kindle Store, in the UK Kindle Store, and in the CA Kindle Store. It's also available in trade paperback. What a lovely analogy, cotton candy for the mind. I so totally agree with you. I write short sweet feel-good romance for exactly the same reason. Escapism. I feel the exact same way, Donna! I used Silhouette Romances, Harlequins, too, as a quick escape when I was in college studying engineering. The stories just made me feel so good! That's why I wanted to write them, to see if I could make readers feel that way. I get the same comments about writing "real" books, but putting a smile on my reader's faces is real enough for me! Thanks for writing this! Well said! I love the fact that romances give our characters a chance to work through some of the emotional issues that have been holding them down. It's always great to read a story where a character comes out a better, happier person in the end. You reference several books that I love and still remember---including Whitney, My Love by Judith McNaught. Great post. I absolutely loved this post. Brilliant! I could So relate. Thanks for sharing with us, Donna. Love your mindset! I think it is important for each writer to understand exactly why she writes what she does and to feel good and confident about it. Thanks to Melissa McClone for telling me about this new blog. I look forward to seeing who else posts. Donna, I loved your post! When people ask me why I write romance it's simple to say, there's so much bad stuff that happens in the world, I like to celebrate the good side of people. Wonderful post, Donna. Those were my favorite books, too. They were a haven for me, an escape, a vacation without the hassle of packing!! Seriously, we are the sum of our parts, right? And that's what we bring to our stories. The Wolf and the Dove is one of my all time favorites. Thanks, for sharing. Glad to see you, Maggie! Thanks for dropping by! I think it's great how all of us read those same books Donna mentions. Such fond memories of those books! I should see if my parents still have them! I absolutely agree. The feel good factor is what I love about romance, and those books that you can just read and re-read. I'd add LaVyrle Spencer's Morning Glory to the list. Oh yes, the Far Pavilions! I'm so glad to find others who love that book as much as I do. Donna, I've been repeating your expression "cotton candy for the mind" to myself all day. What a perfectly apt and evocative image you painted in those words! Thanks for the great post. What is better than a good love story? Reading - and writing - romance is an escape from the drudgery of all the "must do" tasks of life. I totally agree - a good romance is escapism without negative side effects. It allows you to leave the world for a moment, to gather strength, and to return to reality. Thank you for a wonderful post. I'm overwhelmed by all the comments! Thank you so much. I love Sweet Romance Reads!